We are your friendly PISO NET Business provider. In this site you will find the best deal for your piso net business. Our business aims to provide custom Piso Internet Kiosks for individuals who wants to put up their own simple internet computer stations with just a few units and without the hassle of investing too much in terms of manpower and rental. We also provide brand new units for our PACKAGES assuring you the best quality that you get from your investment. We are the only PISO NET provider that gives out lots of FREEBIES that is not available on any other provider. Plus our kiosk is "SLIM TYPE", this saves more space for you if in the event that you decide to expand and purchase more units. 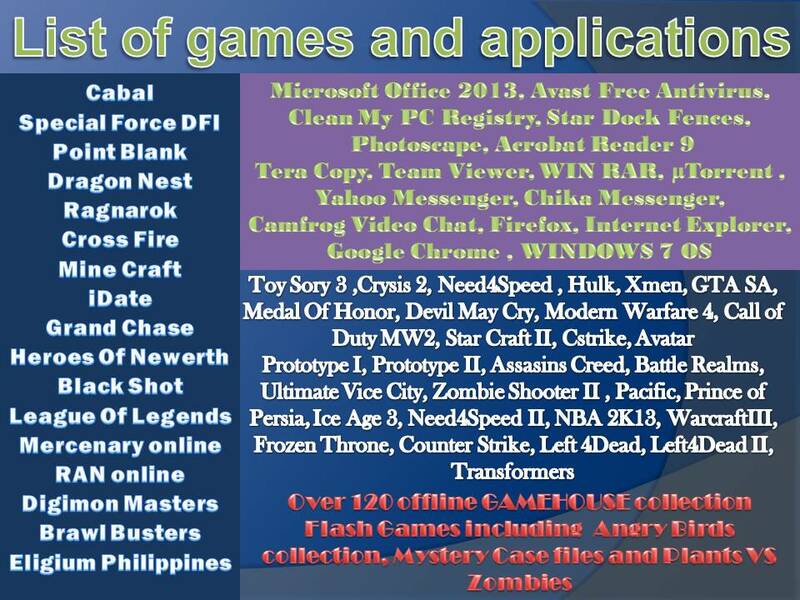 our packages also includes the latest ON LINE and OFF LINE games, Operating System and LAN games. SULIT na SULIT na po kayo dito.This business would surely help provide additional income for you and your family. These are some of the reasons why you should engage in this type of business. Easy maintenance. No need for additional man power. ( bawas gastos,dagdag kita). Can easily be set up just within your own backyard. Utilize the space readily available at your area. Recession proof business.Fast return of investment (ROI) in as early as 3-4 months. Be able to access your favorite social networking sites such as FACEBOOK,FRIENDSTER or TWITTER FOR JUST ONE PESO. A booming trend especially for Filipinos who wants to set up their own computer shop business but doesn’t have enough funds. This is the best offer for you. Your customers will keep coming back, FOR SURE. It’s a well worth investment. DID YOU KNOW that ASIA owns the biggest chunk in the pie of internet users in the world? That’s true. And did you know that our country is rated to be the TOP 6 among ASIA’s highest intenet users? As of today there are an estimated 25,307,800 Pinoy FACEBOOK users. Imagine that, imagine how important internet surfing has been for us pinoys. There are now more women online than men in the Philippines. Majority of Internet users in the country are young people, the school and Internet cafe remains as the most popular access point especially among women. However, more male Internet users access the Internet from their homes. 31% of PC owners have more than one PC at home. 7% have local area network connections at home. The lead adopters of DSL Internet access are men. Internet users who've been online for more than 6 years tend to read less printed newspapers and magazines than those who've been using the Internet for only a year. PLEASE NOTE THAT ALL PRICES AND UNIT SPECIFICATIONS ARE SUBJECT TO CHANGE AND AVAILABILITY WITHOUT PRIOR NOTICE.